The Discovery astronauts bid their station counterparts farewell early Saturday, sharing a final round of hugs and handshakes before moving back aboard the shuttle and undocking from the lab complex. Separation occurred at 8:52 a.m. EDT as the two spacecraft sailed 220 miles above Papua, New Guinea. "Houston and station, Discovery, physical separation," shuttle commander Alan Poindexter radioed as the docking systems disengaged. "Discovery, departing," Expedition 23 flight engineer Soichi Noguchi called out, ringing the ship's bell in the lab's Harmony module. "Dex you and your crew were excellent guests, we loved having you here, you helped us leave the station in a better place than when you got here," flight engineer Timothy Creamer radioed a moment later. "We'll miss you. Come back soon." "Thanks, T.J., we enjoyed every minute of it," Poindexter replied. "Thanks for the great hospitality. We'll talk to you soon." With shuttle pilot James Dutton at the controls on Discovery's aft flight deck, Discovery pulled straight away in front of the station before beginning a 360-degree photo-documentation fly around. Once back at the starting point in front of the outpost, Dutton will fire Discovery's maneuvering rockets and depart the area. "The pilot's big moment of glory is getting to do the fly around of the space station," Dutton said in a NASA interview. "So we'll undock, back away around 400 to 450 feet in front of the space station and then begin to fly a maneuver over the top in front of the space station, essentially complete a 360-degree arc around the space station. Then we'll continue to maneuver to essentially break out of our orbit with the station, so we'll get a real panoramic view. As big as the station is now, I can't really imagine how breathtaking that will be, getting to see it from every perspective." But the public will have to wait until Discovery lands to fully share that perspective. 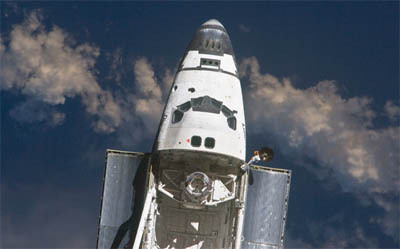 While occasional still photos from the shuttle are possible using the shuttle's S-band communications system, the failure of the orbiter's Ku-band antenna earlier in the mission will prevent routine live television from the shuttle for the remainder of its mission. The combined 13-member shuttle-station crew gathered in the forward Harmony module earlier Saturday for a brief farewell ceremony. "This is time when we have to say goodbye to our friends and colleagues," said Expedition 23 commander Oleg Kotov, one of three Russians on the station crew. "It was an excellent crew, shuttle Discovery flight 19A did excellent job, we enjoyed working with them and it's really, really sad to let them go, but it's time. Let me say again, thank you very much, we're really grateful for your help and your job you did for us. Thanks a lot." Poindexter thanked the station crew for help with "a very successful docked mission and that is in large part due to the preparation that you did ahead of time." "You treated us with just the utmost hospitality and we felt welcome the whole time," he said. "We hope we didn't tear up your house too much. We tried to do a good job of cleaning when we left. It was a great docked mission, very successful, we had three just outstanding EVAs and a lot of great robotics. The transfer team was just fantastic. "Again, I want to thank you and your crew for all the help you gave us with transfer," Poindexter said. "It was just great. We're sorry to go. I know we'd all like to stay much longer, but we have to let you guys get back to your normal routine and get ready for (the next shuttle visit). So with that, we want to say thanks again and we hope to see you soon back home. Take care." The two crews then exchanged embraces and handshakes and the shuttle crew floated back aboard the orbiter for the last time. Hatches were closed around 6:30 a.m. to set the stage for undocking. Poindexter and his crewmates face a relatively light schedule for the rest of the day. A final heat shield inspection, normally carried out just after undocking, was performed Friday so the crew could use the station's Ku-band communications system to downlink the laser scans and video. On Sunday, Poindexter, Dutton and flight engineer Dottie Metcalf-Lindenburger will test Discovery's re-entry systems while their crewmates pack up and rig the ship for entry. Landing back at the Kennedy Space Center is targeted for 8:51 a.m. Monday, but the weather could cause problems. The Spaceflight Meteorology Group at the Johnson Space Center in Houston is predicting showers within 30 miles of the Kennedy Space Center at landing time Monday with a slight chance of showers Tuesday. The forecast for Edwards Air Force Base, Calif., calls for good weather Monday and Tuesday. Weather permitting, Discovery's re-entry trajectory will carry the orbiter above the heartland of America during its descent to the Kennedy Space Center, possibly the last time viewers in the continental United States will have a chance to witness the fiery streak of a shuttle entry. Detailed ground track charts and timelines are posted on the CBS News STS-131 Quick-Look page.